Critically-acclaimed writer Jonathan Hickman (THE BLACK MONDAY MURDERS) and artist Nick Dragotta’s EAST OF WEST, THE APOCALYPSE: YEAR TWO deluxe oversized, prestige format hardcover edition will collect the Second Year of the Apocalypse storyline—issues 16-29 of the ongoing series—and will hit stores this March. EAST OF WEST took the comics industry by storm and defined the sci-fi/western genre crossover long before HBO’s Westworld and other similar stories tooks off in popularity. EAST OF WEST remains a fixture on the New York Times bestseller list and one of the most successful creator-owned series on the market. EAST OF WEST, THE APOCALYPSE: YEAR TWO HC (ISBN: 978-1-5343-0059-0, Diamond Code: JAN170824) hits comic book stores on Wednesday, March 22nd. The final order cutoff deadline for comic retailers is Monday, February 27th. 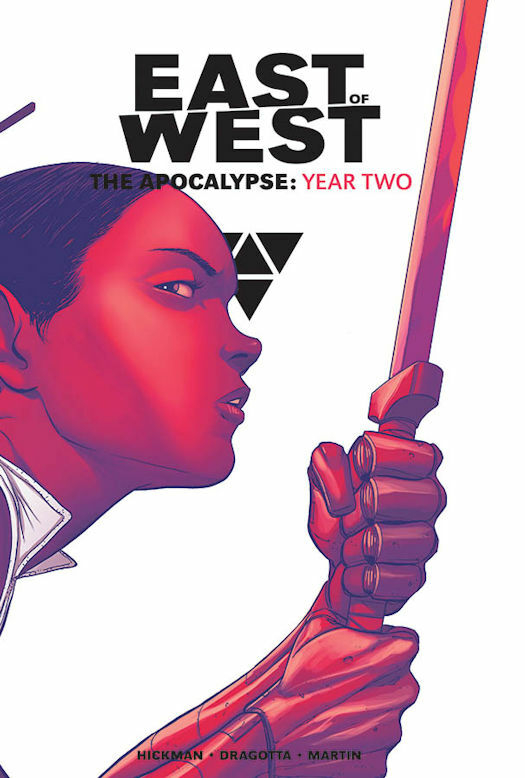 EAST OF WEST, THE APOCALYPSE: YEAR TWO HC hits bookstores on Tuesday, March 28th. It is available for pre-order now on Amazon, Barnes & Noble, IndieBound, and Indigo.